Guess which big EU country might have blackouts this winter? At present, 21 of France’s 58 nuclear reactors are offline. The country’s power prices have skyrocketed, as have imports. Power from fossil fuel is increasing, and the country has now postponed its plans to implement a floor price on carbon. Craig Morris explains why. “Nuclear doesn’t need coal as a backup like renewables do in Germany,” reads one comment meme (such as in the comments here). The reading is already silly: Germany backs up renewables with coal because it has cheap coal; if it had gas (or hydro), it would back them up with that. But now, news from France indicates that the model country for nuclear is itself slipping back into fossil. In September, the French generated more power from fossil fuel than in any September since 1984, according to Bloomberg. Back then, the news would have surprised France; after all, the government planned to build 170 reactors by 2000 and become fully nuclear for all energy (not just electricity). It never got far beyond 40 percent nuclear and now aims to reduce the share of nuclear in the power sector from 75 to 50 percent by 2025. On the other hand, the situation may not be as dire as Bloomberg says. 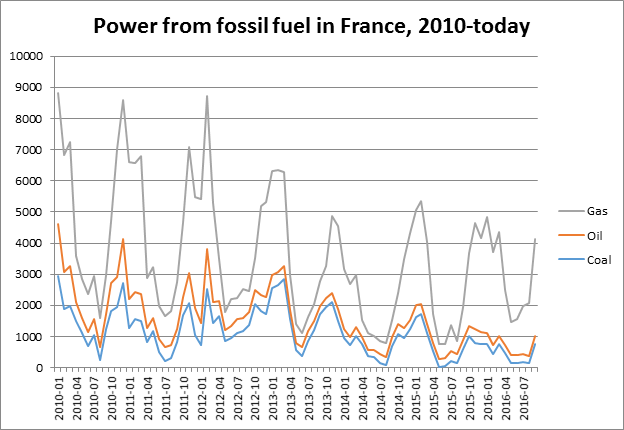 As the chart below shows based on the official raw data, there is a clear downward trend in fossil-fired electricity in France over the past six years; indeed, the “spike” in September is hardly noticeable. 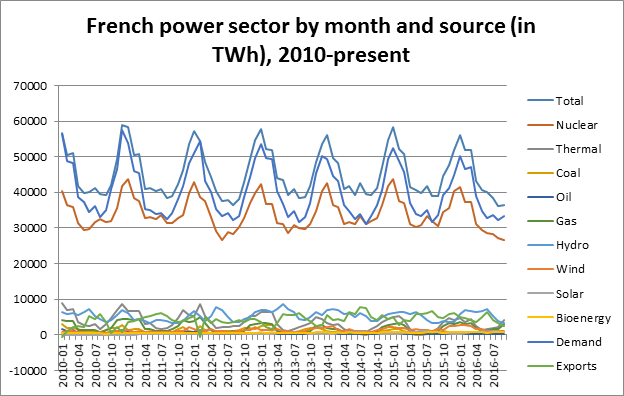 Indeed, that entire chart seems marginal—it’s all in the lines bunched up at the bottom of the chart below showing the entire French power sector. But something is happening; nuclear is sliding down into new low territory. The focus on September is important because monthly power consumption swings with the seasons. It rises as cold weather sets in, mainly due to demand for heat from electricity and for lighting. So the question is whether France is switching more to fossil fuels—and why. The short answer is: it can’t switch. France only has 2.9 GW of coal-fired capacity left. And it takes years to build new coal plants (which, it should be remembered, no one has proposed). What’s more, Uniper (a German firm, formerly Eon) says it will close down its coal facilities in France if the country adopts a floor price for carbon like the UK has (strangely, the firm is still in the UK). Nonetheless, this threat and others from industry is one reason why the French government backed down from a proposed carbon floor price in October. But clearly, France won’t return to coal, which it does not have. But why the dip in nuclear? The ASN, which regulates French nuclear reactors, is becoming a fierce watchdog. In mid-October, it demanded the closure of five of the eighteen reactors it is investigating based on safety reasons (report in French). A total of 21 reactors are now offline, and the French are starting to worry about power outages in the winter, with the head of French utility EDF (which operates all of the reactors) saying at least four but possibly up to twelve units will not be available this winter (report in French). France may not be able to import enough electricity in case of a shortfall, either. Back in February 2012 (yes, the winter after Fukushima, when many claimed Germany would rely on its nuclear neighbors), power lines from Germany to France were maxed out. Germany saved France from an outage then, and there was no shortfall in French nuclear power production at the time. A bitter cold spell would indeed be challenging. Prices on the power exchange are already greatly diverging. French prices are roughly 50% above those in Germany on the day this post was written, and German/Austrian prices remain the lowest in the comparison. The situation is thus tense in France and may remain so, possibly even worsening depending on how the country’s nuclear fleet fares. To put it bluntly, France cannot afford to lose all the reactors it would need to close by 2025 in order to meet its official target of only 50 percent nuclear power. It might want to start a massive buildup of wind farms, which would help cover the winter gap. And the country could switch from electric to gas heaters. 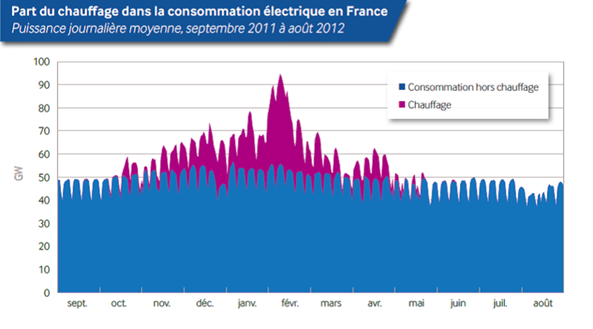 Half of French power demand results from electric heaters. So sit tight and keep your fingers crossed. We may have blackouts in a big European country this winter. Just not the one Energiewende critics would have picked. Craig Morris (@PPchef) is the lead author of German Energy Transition. He is co-author of Energy Democracy, the first history of Germany’s Energiewende, and is currently Senior Fellow at the IASS. EdF has to buy back the electricity they previously sold for € 42.-/MWh since EdF’s atom reactors can’t deliver it. Strange to see a non-existing good change hands twice and all make a profit but never producing it …. Saint-Marcel (Bourgogne) and Jeumont (Nord). The national grid provider RTE (owned by EdF) plans to present their winter plan in November. “France may not be able to import enough electricity in case of a shortfall”. It is worth noting that France mucked around for at least a decade with respect to the France – Spain interconnector – eventually throwing away Euro800m on a u/g HVDC system. A couple fo 400kV double circuit O/H lines at 1/10th of the price could have been built – but RTE wanted something big to add to its asset base (cos that is how it is paid – return on asset base) so HVDC it was. Mike Parr: I thought the supercharged NIMBYism of Catalan nationalists also had something to do with the extravagant decision to dig a tunnel under the Pyrenees, a decision brokered by the EU. IIRC they were the leading objectors to an overhead line. The silver lining is that as it’s a tunnel, it should be possible to increase capacity relatively cheaply and quickly. The situation is getting worse now, a cold spell and further delays in restarting atom reactors have driven power prices through all celings previously seen. Every day now EdF delays more and more restarts, read Reuters. How much does the failure of the atom fleet cost to the British/German/Swiss/Dutch …. economy this and next year, it’s citizens? Just the extra costs for electricity? I’d say several Energiewende could financed now with this money. But it ends up in the hands of the Mafia. Is France falling back to coal age? They haven’t linked a source in the head line and it is a pay-wall protected article …. Swiss Alpiq and Axpo have tried to give away their two atom power plants in Goesgen and Leibstadt FOR FREE ! EdF – French state company oganizing black-outs – DID NOT WANT them. Despite plenty of cables between France and Switzerland. There could be two European atom nations getting dark this Winter, Platts has reported on this chance. The weather and modern times – dear me.